Find Golden, CO Homes for sale. View Photos, Maps and MLS Data Now! The convenient location of this home offers access to Kyffin Elementary School, the Colorado Mills Mall, downtown Golden, and the W Light Rail line (hello downtown Denver!). You're minutes from everything. MLS#5408623. LoKation Real Estate. Be sure to view the narrated video tour. MLS#2106524. Golden Real Estate, Inc..
Golden Proper - Property is priced "as is" based on bids received for structural repairs. MLS#7594054. RE/MAX ALLIANCE. Mesa Meadows - Click on a virtual tour link to view a narrated walk-through of this home with the listing agent -- just like an actual showing! MLS#3941925. Golden Real Estate, Inc..
New windows throughout and many systems updated (see Amenities Sheet in Supplements). MLS#9426831. Keller Williams Advantage Realty LLC. Don't miss the walk through video in the virtual tour! MLS#1798466. RE/MAX ALLIANCE. 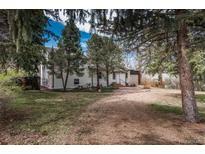 Wide Acres - Also Enjoy The Covered Patio & Private Hot Tub! MLS#7377911. Brokers Guild Classic. Canyon View - Bathroom, bedroom, office/bonus room and plenty of storage. MLS#8796810. OLDE TOWNE GOLDEN REALTY LLC. Wide Acres - Urban farmers delight! A rare and unique opportunity! MLS#2653661. LIV Sotheby's International Realty. Cody Park - Mother-in-law quarters with full kitchen in the lower level with walkout access. MLS#5441842. WELCOME HOME REAL ESTATE LLC. Canyon Point - Walking Distance to Downtown Golden, School of Mines, Biking/Walking Trails, Parks & Highly Rated Mitchell Elementary. MLS#9203067. SOLDBOT INC.
Great Sixth Avenue West 2-Story sitting on a cul-de-sac w/ an incredible location - City light views - Backs to A-Rated Kyffin Elem, walk through the back gate to school - The backyard is your own private oasis w/ lots of privacy & convenience - Enormous (partially-covered) deck allows for year-round enjoyment of the setting - The home has been nicely updated - Beautiful oak hardwoods grace the main level - Remodeled kitchen w/ newer cabinets, slab granite & tiled floor - Durable laminate flooring throughout the upper level - Large master bedroom w/ double closets - Completely updated master bath w/ custom tile work, new cabinets, counters & heated floors - Lots of windows & light - Garden area and front courtyard - Newer Roof, Furnace & Gutters - Walk to the trailheads of Green Mountain Open Space - Easy commute to downtown, bus lines, Light Rail, St. Anthony’s, the Rocky Mountains and the Federal Center - Close to all the wonderful Union Square Restaurants - This is a special home. MLS#2638105. MB REYNEBEAU & CO.
Paradise Hills - HOA includes road maintenance & weed control. MLS#2496450. Estate Professionals. This home is ready to go! MLS#7548210. COLDWELL BANKER DEVONSHIRE. Coal Creek - Mountain living at its finest! Showings begin Sat, 4/20 MLS#6744273. MOCK REALTY COMPANY. North Golden - Not enough room to list it all here, schedule a showing before it is gone! MLS#8982183. NeXstep Real Estate Group. This home is updated and has been well maintained over the years. MLS#7765123. Go Colorado Realty. Coal Creek Canyon - Easy access to Boulder, Denver and Golden. Seasonal Snowcapped Views. MLS#2317944. MOCK REALTY COMPANY. 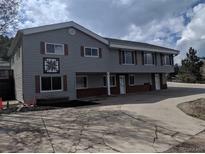 Cody Park - Don't miss this great opportunity in scenic Golden Colorado! MLS#4461234. RE/MAX Professionals. Genesee Park - A full list of updates, video, and additional photos can be seen on the Virtual Tour. * MLS#3051399. HomeSmart Cherry Creek Properties. Genesee Park - This home is located in the perfect location close to ski areas and the city! MLS#7521558. Discover Real Estate LLC. Shelton elementary is in the neighborhood as well. OPEN 2-4 SAT APRIL 20. MLS#9089337. Fathom Realty Colorado LLC. & painted walls & ceiling, copper air lines ran in the walls for compressed air, A compressor closet w/ a 60 gallon, 5 hp air compressor, 220 volt welder circuit, 50 amp, epoxy coated floors. New gutters/downspouts. MLS#8514934. Colorado Flat Fee Realty Inc.
At the end of a long day, retire to your warm and inviting main floor master suite with a spa inspired bathroom as you drift off to sleep away from the bustle of city life. MLS#5482900. LIV Sotheby's International Realty. The COVERED front porch (welcoming visitors) plus a back patio, complete this lovely Golden home that is minutes to shopping, restaurants & a direct route to both Arvada & Boulder. MLS#1784189. RE/MAX ALLIANCE.